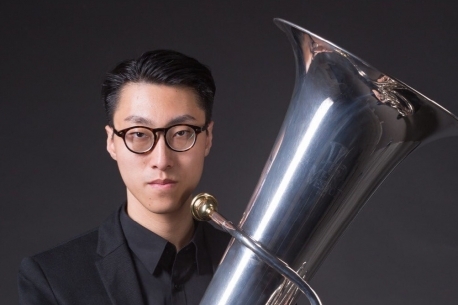 Geoffrey Lau is currently studying a Bachelor’s degree in Hong Kong Baptist University majoring in tuba. Under the guidance of Mr. Lam Wing Tsan, the tubaist in Hong Kong Sinfonietta and Mr. Yongyut Tossponapinun, the tubaist in City Chamber Orchestra of Hong Kong, he develops his music career in a wide range of knowledge from different styles, classical and jazz. He has participated in masterclasses given by Roland Szentpali, James Gourlay and Chris Olka. Geoffrey started his tuba study at the age of 7 under the coach of Mr. Tsan Lam in the school. During his studies in early age, he was an active member and tuba principal in school orchestra and concert bands. He participated in school concerts including ensembles performance and musical. He participated and won prizes in Hong Kong Schools Music Festival in orchestra entries, concert band entries, brass ensemble entries and in solo entries. In HKBU, Geoffrey joined the HKBU Wind Symphony, Symphony Orchestra and Brass Ensemble as a tubaist in year 2014. In 2015, he serves as the principal tubaist in HKBU Wind Symphony. In 2016, he participated in HKBU Jazz Band. He highly participated in school concerts including Gala concert, ensemble concerts and Horizon concert. Outside school, Geoffrey is enthusiastic about performing. He served as a guest tuba player in different local ensembles including Hong Kong Children's Symphony Orchestra, Hong Kong City University Philharmonic Orchestra and Hong Kong Wind Symphony during 2014 to 2015.